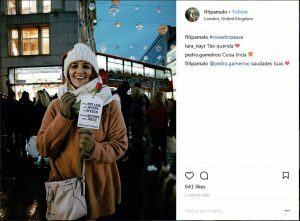 LONDON, UK – Dozens of Muslim youth braved freezing snowy weather to give away 6000 roses to the London public, in honour of the birth of the Prophet Muhammad (PBUH) as part of the annual #RosesForPeace event organised by the Love Muhammad campaign in Oxford Circus, London, England. Many of the recipients of the roses took to Instagram to show their appreciation & love for this wonderful heart-warming initiative. Many more recipients were sharing the feeling of love they received via Instagram. The themes of kindness and love was clearly crossing the language barrier. There was a lot of love in the air. 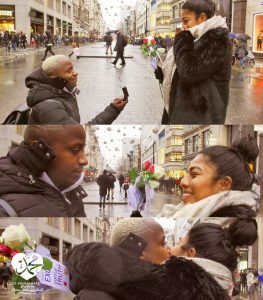 A French couple attending Oxford Circus during the #RosesForPeace event, decided the moment was right to propose to his girlfriend and make her his fiancé. She accepted of course, clutching the roses in her hands. It seems the roses truly brought out the love inside many who received them. The Love Muhammad campaign has been active for 6 years, celebrating the diversity of the Muslim faith with events held annually throughout the UK, Australia, various Middle Eastern and Asian countries. 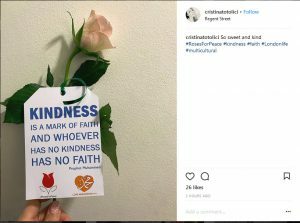 Recently the birth of Prophet Muhammad (BPUH) has coincided with the Christmas season, a strong sense off outreach was envisioned for the #RosesForPeace initiative, to celebrate these two occasions together. 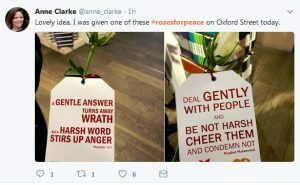 Every year the amount of roses has increased from several thousand, to last year where twelve thousand roses were given away to the UK public in multiple cities, to fifteen thousand roses given away this year. The name of Islam and Muslims is constantly under attack by various groups, and Islamophobia is on the rise within the UK and other European countries. 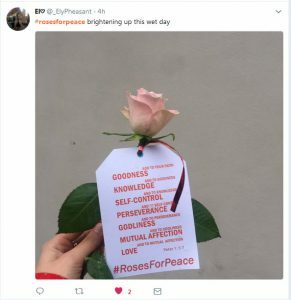 Initiatives like #RosesForPeace are one way of countering this negative narrative and creating a positive and more accurate narrative about Muslims and the teachings of Islam. Prophet Muhammed (PBUH) managed to truly change the Arabian society of its time into a force for positive change, and creating a path for those who follow the religion of Islam to progress intellectually. Muslims in the West have also felt a need to develop more comprehensive, intellectual and engaging arguments to counter the negative perceptions created with in non-Muslim societies. #RosesForPeace is one of those initiatives. MA in Film Production & MA in Islamic Studies. Film and documentary director, producer a poet & writer based in London.